The Movie Recorder comes with our free Movie Player, which will prove to be very valuable as it saves time and money and it’s a pleasure to work with. It allows you stitch the camera images together to create an immersive view. If you run the same camera setup on a regular basis, you just save the setup settings once so you can quickly start working with new recordings. Watch geo-referenced video, zoom in and navigate on the map. The location of the video will be shown on the map. 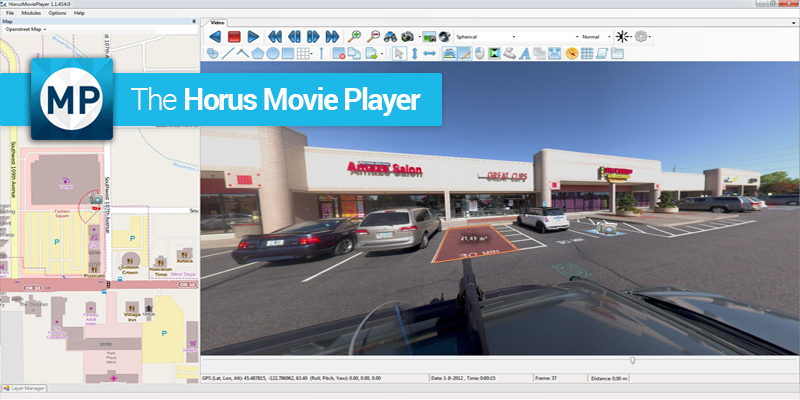 The two additional modules for the Movie Player are the Annotations Module and the Layer Manager. The Annotation Module is a must-have when you perform inspections or inventories on roads and roadside assets, such as traffic signs, public lighting and other property. This module allows you to pinpoint locations on maps and perform measurements to calculate distances and surface areas. You can add forms to register damages and irregularities, and export these forms to Excel documents. Older annotations can be visualised so you can easily assess and anticipate deterioration. The Annotations Module is used by companies and (local) governments that are responsible for the maintenance of roads and other property outdoors. The major advantage is that you can do a more thorough inspection under the safest of conditions: from your desktop. Our Layer Manager allows you to integrate your CAD and GIS data into the images. The integration is bi-directional. This means you can select and modify the imported data in the Movie Player, for instance when the CAD profile of a curb or the position of a lamp post deviates from the actual situation. The great advantage of the Layer Module is that deviations are visible at a glance and it’s easy to correct these flaws. The annotations you’ve made with the Annotation Module can be opened in the Layer Manager. The output of a video inspection or inventory can be exported as a GIS file, so it can be viewed in you GIS viewer.